As early as 1910, the Board of Directors of the Wilmington YMCA began offering camp for boys. In 1938, the Y purchased Tockwogh for $15,000. That summer, buildings on the site were reconditioned and the present athletic field was graded and seeded. 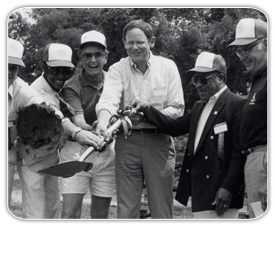 Over time, the camp expanded facilities and amenities and additional land with campers and counselors contributing improvements to camp property. Tockwogh added a family camp week in 1946 as well as weekend groups during the off-season. Camp is now open and in full operation from mid-April to mid November and has expanded to serve groups of up to 95 people throughout the winter. In 1961, the YMCA invited the Wilmington Young Women’s Christian Association to co-sponsor a girls’ camp at Tockwogh. The first years, girls came to camp for three weeks. In 1963, they came for the full summer. The number of girls keeps increasing each season.